There are approximately 30 million Nepali people living in Nepal. The number is probably higher as the last census was in 2011. In 2016 the Nepali government confirmed that the word "Nepali" should be used instead of "Nepalese" though both are still widely used to describe the over 101 different ethnic groups that make up the countries population. For most tourists the biggest distinction will be that Hindus make up 81% of the population, Buddhists 8%, Newars 4.4 %. Again, for tourists, it's also important to note that within the main religious beliefs are certain ethnic groups and castes. Hindu's in Nepal follow a similar caste system as India but it is officially "different". Chhetri are the largest caste while Brahmin are often met within the business sector. It's a complicated, decisive and at the same time unifying mix of people that manage to live in relative peace together. On this page we will look at Nepali people from a tourists perspective which will help you travel there. We'll avoid long-winded distinctions. Probably the most important thing to realize as a tourist is that there are differences between Nepali people that may affect your travel there in terms of learning or understanding the culture. e.g. 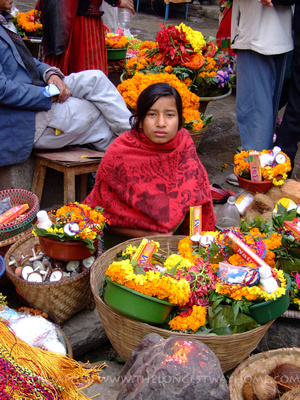 A Hindu may not know as much about certain aspects of Newari culture as a Newari would, and vice versa. Keep this in mind when traveling and it will explain why answers often change in Nepal. The words "Nepal" and "Nepali" are thought to have originated from the word Newar who are recognized as the first "inhabitants" of the Kathmandu Valley which was the first unified region that later encompassed greater Nepal. 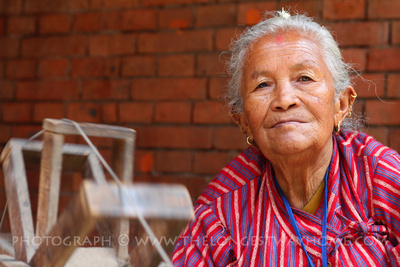 Historically, Nepali people are descendants from several neighboring countries and indigenous peoples. The majority of today's people would have ancestors from India and Tibet. As Nepal was once a part of a huge trading route Nepal ancestry also can be traced to the people of Burma and Yunnan. Continuing even further back people from Central Asia. It's quite interesting to note Aryan features in several Nepali people. For ease of learning, it's easier to keep things relatively basic to understand Nepals main ethnic groups. This starts with the greater ethnic groups living in the North, mid and southern regions that have traditionally occupied these areas for hundreds of years and understanding why they inhabited these regions to begin with. 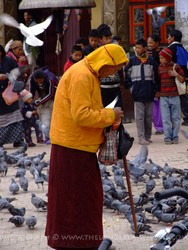 Sherpas: coming in the early 19th century from Tibet, Sherpas are largely Buddhist. 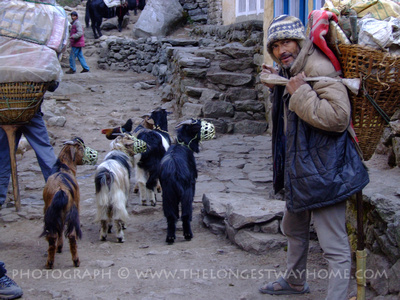 Famed as hard working trekking guides and porters they are also involved with agriculture. It is incorrect to call a trekking or mountaineering guide a "sherpa" it is simply an ethnic group. Dolpa: from the central west of Nepal the Dolpa were once nomadic but have largely settled. They are thought to have arrived via Tibet and are Tibetan Buddhists. Manang: also known as Manang Bas they are largely Buddhist but also follow Bon-Po which is an ancient form of Tibetan Shamanism. Within this region are Tamang, Gurung, Thakali, and Manangba. Lopas: Not so well known is this ethnic group from the former kingdom of Lo in Upper and Lower Mustang. Largely Buddhist with their own distinct language. The midlands of Nepal are richly fertile and filled with valleys. Here Hindus of many castes prevail also included are the original settlers of the Kathmandu Valley the Newars along with other ethic midland groups like Kirati, Tamang, Magar, Gurung, Thakali and Chepang among other ethnic groups. Newar: most of the famous architecture, stupas and temples you see today throughout the Kathmandu Valley are attributed to the Newars. They have a complex system which is both Hindu and Buddhist along with castes that can include various other cults or beliefs. Kirati: predating the Newars the Kirati are largely found in eastern Nepal. Kirati follow their own religion known as Kirat Mundhum which is the belief of nature and their ancestors. Tamang: traditional horse breeders who follow Buddhism they are largely found in the outskirts of the Kathmandu Valley. Magar: having roots in Burma and Tibet these Buddhists mainly occupy western Nepal. Gurung: another rather famous ethnic group to a large population joining the fierce Gurkha army regiments. Largely Buddhist they are located in the mid west of Nepal. The south of Nepal largely consists of Tharu, Rajbansi, Satar and Musalman ethnic groups. A lot of this region shares ethnic values and beliefs with Northern India due to the open border along here. Tharu: this is the largest ethnic group in southern Nepal known as the Terai. They share many physical traits with north Indians and are Hindus. Farming is their main occupation with modern business practices a distant second. Rajbansi: found largely in the eastern Terai region. This ethnic group are a mix of Muslim and Hindu known for their farming. Satar: come mainly from the Bihar region of India and are largely Hindu with a few Muslim. Madheshi: a mix of Muslim and Hindus in the Terrai region which shares an open border with India. They settled in Nepal during the 19th century. The caste system in Nepal today is largely based on the Indian caste system. Just don't mention that as it's firmly the Nepali Caste System. Their are 36 castes in Nepal today excluding Newari castes which are often considered even more complex. However, as a tourist you are likely to only hear about Brahmins and Chhetri (largest). It is not good to make fun of the caste system or to automatically assume someones heritage due to their caste. The younger generations are becoming more flexible in their dominant and traditional caste traditions. Do learn more about the Nepali Caste system. Nepali people have established a wonderful reputation as being friendly to tourists. That still stands true today. Although sharing many similar ties with India, Nepali people are considered to be more friendly and honest with tourists. Tourists should still take care. Despite their friendliness in major tourists cities Nepali can seem very friendly but still take financial advantage of a tourist. Similarly Nepali men have a reputation of being charming to foreign women in order to establish a relationship with them for financial rewards, garnering a way to leave Nepal via marriage or for the bravado of sleeping with a foreigner. Nepali women on the other hand are a lot more reserved and less likely to enter into a relationship with a foreign man. However the younger generation are changing with nightclubs and bars being popular hangout places. The issue is either raised via illegal prostitution or with severe penalties among elders should they be seen to be promiscuous. Tourism has had both a positive and a negative effect on the Nepali people. Negative aspects largely surround the influence of foreign cultural traits, a loss of tradition and cultural misinterpretations. The positives include increased financial stability, better education and health facilities. Nepali people are very open and respectful of all cultures. It's very easy to forget that a tourists influence can have long term negative effects on Nepali people. It's also important to note that Nepal is currently under going a huge shift in culture and politics. A new constitution, 24 hour electricity, high-speed internet have all only recently arrived in Nepal. Young people are being more independent and educated. Older traditions are often pushed aside at the expense of national identity. With these things in mind tourists should follow some simple do's and don'ts when interacting with Nepali people. Do not tip - this is not a traditional Nepali custom! A little known fact that is often overlooked by tourists is that it's worth hiring a tour or trekking guide for a particular region who is from that region. A prime example of this is within the Kathmandu Valley. Many tour agents and operators hire "anyone" or mainly Hindus. For those with an actual interest in buildings, heritage or history it would be far more beneficial to hire a Newari guide as so much of the Kathmandu Valley's heritage is Newari. Shouldn't a Hindu or Buddhist guide know this information too? Yes, technically they should, but they don't. In fact many tour guides don't have a clue about Newari heritage. It's also one of the reasons why it's better to hire a guide from the trekking region you are going, someone who's grown up and trained there, than someone from another part of the country. This is one of the main differences my guidebooks to Nepal have over any other. Each region is discussed as per that regions history. Likewise I list local guides and agencies who specialize in these regions.